On a slow boat leaving China, Nam-Su told me “workers” in Chinese factories added parasite cysts to exported food and it went undetected. I sat speechless, wishing the boat would go faster. Friday Fictioneers is hosted by Rochelle Wisoff-Fields. First, the “slow boat from China” part was a play on the phrase “Slow Boat to China” from the old song by Frank Loesser HERE. That song has a romantic take and they want a slow ride all the way “to” china – and here in my fiction, I have a creepy bunk mate – talking late at night – and I want the boat to go faster…. “from” China…. Second, two days ago I read a news story (here) about how Communist North Korean workers are employed at seafood factories in China. I guess these workers send 70% of their income back to North Korea – and the article focussed on how this income source is funding North Korean war efforts. They argued that indirectly Americans are helping to pay for the war supplies in NC. Good point. I think we accidentally ignore the idea that pathogens could be delivered to us via food (or meds prepared abroad). And then later, perhaps years later, that exposure could wreak havoc on the individual’s immune system (from a strained GI tract and sinus cavity nests). Many claim that when ingesting parasitic-laden food “most infected humans remain asymptomatic — some may feel slight abdominal discomfort or nausea — though there are rare cases in which the infection can turn serious.” In my humble opinion, unless people have really good stomach acid and plenty of enzymes pumping (and most folks do NOT these days – esp. the many with candidiasis throughout their gut – Check out “My Ra Diary” – here). well you can have certain microbes run through your system for years before you feel sick from them. And then when you do show major symptoms, the doctors here tend to “rarely” consider parasitic infection. It has to do with their training. And I firmly believe this overlooking of parasites is wrong. Parasite infection is disregarded as a third world country problem when it is very well everywhere – especially as we share global foods. Everyone has “some” parasites inside their gut – it is human to have them and in light amounts has some health benefits – but when the parasite load becomes too heavy – the body then suffers – it can be gradual and it can be shown with thyroid problems (especially flat worms wreak havoc on the thyroid function), could lead to weight loss or gain, hair loss, not feeling well (like with fibro) and a myriad of other conditions and co-infections. I humbly believe that many illnesses that are misdiagnosed as “auto-immune” actually have a parasitic connection. Further, many people have fungal infections that stay systemic, let out mycotoxins, and lead to malabsorption. And because so many Americans eat a high sugar diet (even tho they do not even realize they eat a lot of sugar – it is so the norm and would never seem high – but it is – and it is daily – and each time it slowly pulls from immune function – just sayin’) and many folks continue to feed any pathogens (and these pathogens also send out enzyme inhibitors…. and maybe make biofilm to survive….). So I suggest to not eat food that is handled by potential enemies. This is all for educational purposes and I strongly suggest that everyone considers cleansing the gut at least once a year. If a person is sick – they might need to do an 18 month on and off cleanse and then supplement to rebuild their bio-terrain. And if nothing else start to take enzymes with your meals – and with heavy meals maybe take some Betaine (I like a brand that has BetaineHCL/Pepsin/Gentian Bitters- and I keep it in my purse) because this could help break down food and destroy any small microbes or parasite cysts – while also helping you get more from your food. Without the extra added explanation this is just plain frightening. Well done. That’s very scary. Nicely done. October 7, 2017 at .. I really, really hope this is just fiction. Your arguments are awfully convincing. BTW, which food do we get from China? 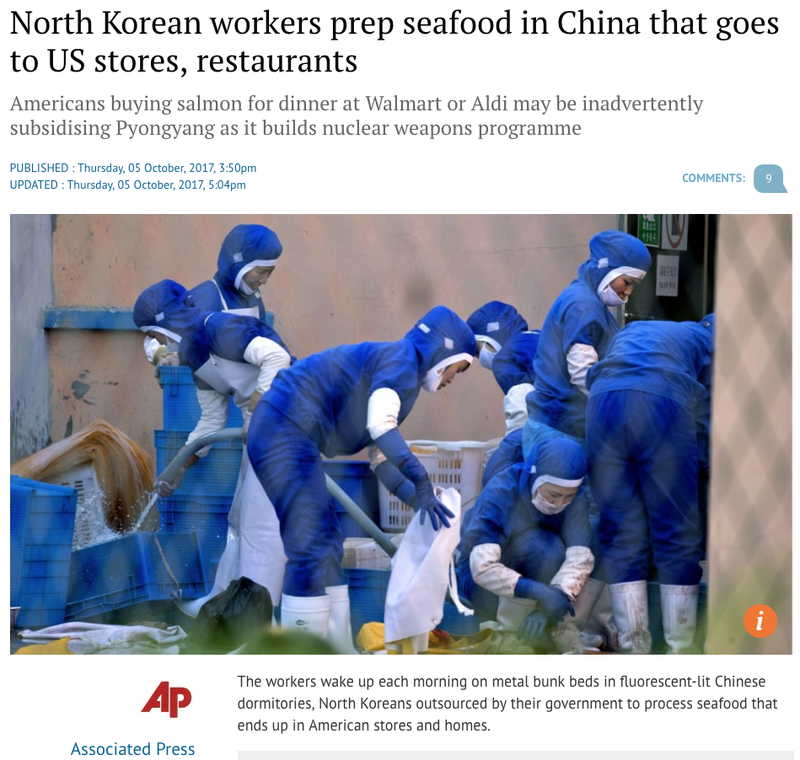 Hi – I guess the articles were referring to seafood coming from China – but so much comes from there – I think we would be amazed…. the riding on the boat part is fiction, but I do believe the potential is there for small things to be intentionally added to exported food – but more than likely pathogens come from mass production processes – like recently here in richmond va – a lady found a huge worm in her frozen fish (I will see if I have a photo) and the local news did a story on it. but we have no way to see if the water that housed the fish had heavy metals – nobody tests for that – nor do they test for microbes that can grow – and could wreak havoc – anyhow, thanks for the comment. What is not made in China these days? The situation is pretty scary. World Wars 1 & 2 were honest to the extent that they were tests of military strengths. But any further war will be a shadow one with chemical and bio-weaponry at the front and center. Better go back to farming your own food. first – the source of China for everything – almost everything cos here in the States a business deal was just stopped that would have allowed military gadgets to have parts come from overseas – and Obama’s admin stoped a similar deal during the late part of his term. So whew – glad we have sense to watch some manufacturing. and bio-weapon stuff might have been in place since even before Lyme hit the scene – I once heard someone say that the scattering Nazis sprinkled some “crap” around as they dissipated post war. There are the Brazilian twins (Nazi angel of death Josef Mengele ‘created twin town in Brazil’) and then some trace AIDS fungi strands back to the 1950s – all these infants in europe were exposed, but only a handful had immune suppression. but the real part that blew my mind was only recently were sanctions imposed on NK for their textile exports. and then there are stories of small nano stuff – like the Kawasaki jacket that had a microscopic metal item (with gunk and a patent #) found in the tag…. Hmm, your have made many good points here. Are those harmful pathogens killed when cooked or they can survive even cooked? Eating them raw or semi-cooked is definitely risky. you make an excellent point – and I guess that is what they say about swine parasites too – the cooking (at a certain temp) can kill them. So yes – I’d say you are correct YC – that the real risk is sushi (raw) or undercooked. However, some believe that certain parasite cysts have a tough exterior coating that might be able to withstand heat – or some suggest (really) that geo-engineering might make one that is more heat resistant. That is a good point about certain organism can withstand heat or you would need to very high heat. I am a little more concern about chemical that some time is put into the food (malicious intent or just plain ignorance or for high profits). I may give up on eating in general after that! Thank you for that reminder — even if it started out as fiction! I’ve gotten so far away from your advice but I’m getting back on track slowly but surely. We have been trying to confirm that anything we bring into our house (particularly food items — for people and pets — has nothing to do with overseas. I freaked when I heard somewhere that chickens raised here are then sent to China for processing and return to the U.S. And this after all the food recalls. Heaven help us! oh wow about the chickens going there to be processed. It does not surprise me – we really are not being as alert as we should be. and then some people are so tunnel visioned they refer to some people as “alarmist” if they speak up about certain things. so the spotlight of truth can be much if flooded our way – which is maybe why I went there with this topic for a fiction. Great story, Yvette… Though most frightening indeed. I have given up on eating anything from Asia in general. The whole Tilapia story turned me off. How sad that we have come to this, don’t you think? and we have a asian buffet restaurant – and a few years ago I stopped going because the all you can eat price was too good to be true – and then I started questioning how they could serve all that seafood (octopus, squid, different shrimp, salmon, etc.) for so cheap – and well…. Such a well done, cautionary story . The pleasure is all mine. I did check your friend’s blog and was surprised to discover yet again how our ideas are merely universal waves, there’s nothing wholly mine. A scary story. However, don’t panic folks. The level of checking that goes on in the food industry is very considerable. And consult a medical practitioner before doing anything drastic in the way of ‘cleansing your gut’ or taking food supplements. well thanks so much for your comment. I really do value you it. And I have seen how others like your specific comments and tips. And yes – always check with one’s doctor, but in my humble opinion, I believe that the last five decades have “conditioned” people to not think for themselves. And cleansing the gut is portrayed as something dangerous – when it is not – if you use mild herbs and go slow and read about it – but most people want to be TOLD what to do and then they accept medication after medication – and so I chuckle when folks refer to cleansing and taking vitamins as drastic. however, it is not a bad or disrespectful chuckle – because I was there with most people in this view. I felt that vitamins were a gimmick – or not needed – and the ladies i knew in the 90’s who claimed the huge benefits of “cleansing the gut” – well I put them off at the time as not being as smart as docs from med school – but now I see that they knew their stuff. and so here is the thing, dear pennygadd51 (and seriously thanks again for your comment) but I challenge anyone who is sick to consider cleaning the intestines. Because while this may seem “out there” or “drastic” to you – I believe there is a delusion in our medical system that keeps people dumbed down, afraid to research on their own – and I know there is a myriad of info out there – but truth has a way of resonating – especially when you see evidence through healing and restored health. And without cleansing the gut, the immune system is suppressed and malabsorption is more common than you’d imagine. And you know, I seriously would love to talk more with you about how considerable you think the checking is in the food industry. They can only do so much and when they catch things – we do not always hear about it. And even with the best of tests, small cysts can be in food. One last thing – we do not get parasites only from food. They are in the air, soil, pets, and water. Some people are exposed to flukes from lake water – they get on the skin and can enter that way. There are other vectors too – like mosquitoes and tics. And seriously, I believe that one of the reasons some LYME patients cannot get better is because of a small micro worm that has crossed the blood-brain barrier. Well written, and very well argued. “I believe that the last five decades have ‘conditioned’ people to not think for themselves” – you are spot on here. Most people are ignorant – they don’t question the establishment – believe what they are told – eat what they are fed. It takes a lot of courage to question – and to seek the real truth (unfortunately we have to prefix truth with real these days – can truth stand on its own?). I have always been super impressed by your knowledge and advice. Please keep it up. Though ignorance is bliss, we can’t host it forever. “I believe there is a delusion in our medical system that keeps people dumbed down, afraid to research on their own” – TRUE! Hi M – well thanks for your comment and your wisdom has truly sharpened me since I have known you. And I only learned all of what I know in that area because I had to get my own body terrain back in tip top shape. was working with a small group and the topic of “tough childbirths” came up and noted how so many woman used to die during childbirth – it can still happen – but our advanced system has really helped many woman successfully deliver. – and so with the flaws we have a great some things. and now I have heard some doctors advice that patients to “not” research on their own because they can get bewildered from the sea of bad information. or they can get confused – which is true- like some things cannot be easily reversed – for example, if someone has MS the damage to the myelin sheath won’t get repaired – and some folks on “curezone” were saying it could be reversed. HOWEVER – this passive acceptance of “trust your doctor ” (who usually makes money for pushing drugs – and who really believes drugs are the course of action) well they are also in the dark on many topics. “delusional dismissal” – you nailed it! And thanks for sharing your knowledge. Terrifying! Well done. I’m terrified. October 9, 2017 at ..
You know, that’s really kind of terrifying. Glad it’s just fiction–right? RIGHT?? That was a good story and also with a message. So scary on the food that we eat. Very important to have a healthy diet. Thank u. I like reading and encouraging, appreciating my fellow writers for their wonderful work. Thks will go thru ur other posts. Same here. Have a nice day ahead. China rite? My day will start too.